The bench press is the most popular strength-training exercise in the U.S., but most people don’t know how to do it correctly. I’ll give you full disclosure and admit that I’m not a huge fan of the exercise. The reason is not because the bench press is “bad” per se. It can add strength and size to your upper body pushing muscles and this, in turn, will carryover to many sports. The problem I have with the bench press is this: out of all the strength-building exercises it’s one of the most common exercises that guys screw up. 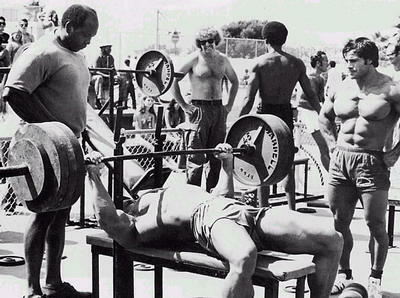 When you bench press with poor form it can really wreak havoc on your shoulders and elbows. That’s why it’s imperative to get the technique right. Luckily, Jim “Smitty” Smith has put together a comprehensive list to ensure that you’re pressing with perfect form. With this information you’ll build awesome upper body power while saving your joints. Smitty: There are seven very important key points to remember when performing the bench press to ensure healthy shoulders and longevity. In fact, these key points apply to all the horizontal pressing movements in general. 5. Row the weight down to your chest, like a bent over row. Do not relax and let the weight drop. If there is pain with this movement, regress back to a neutral grip dumbbell bench press. This means that you take a set of dumbbells and do the bench press with your hands facing each other. Sometimes this is referred to as a “hammer” grip or a neutral grip. If there’s still pain my suggestion is to regress further to more of a basic, fundamental movement, such as a push-up. The push-up is an incredible tool that most lifters don’t do because they want to build a big bench. So they spend hours in the gym on the bench press, with poor form wrecking their shoulders. Follow these steps, but don’t forget to always include basic movements such as a push-up. CW: Thanks for the tips, Smitty! Just a heads up to let you know that the SALE for Smitty’s excellent muscle-building system, AMD 2.0, ENDS TODAY. So if you dig these tips, and if you want more strength with muscle, be sure to check out his training system and Save 20% today by CLICKING HERE. I don’t think this types of exercises are good for a scoliosis case. I have scoliosis. CW: Correct, with scoliosis you should only do the exercises that are approved by your doctor/therapist. Good tips. I have shoulder issues and largely prefer neutral grip DB press over standard press. The problem is my current “gym”only has DBs up to 110. These are too light as I was getting 5 reps with 150s at my old gym. Any other suggestions on how a guy like me should train for upper body mass/power without heavy DBs? CW: Use HFT for the push-up. Perform 1-2 sets of as many reps as possible 6 days per week. Place dumbbells on the floor, parallel to each other, and perform push-ups with your palms facing each other since it’s easiest on your shoulders. Be sure to push your shoulder blades apart at lockout. Great info. I typically workout by myself and don’t have a spotter so I bench on the smith machine. I know the smith machine isn’t great for squats like most people think it is, is the same true of benching on the smith? CW: A smith machine bench press is pretty worthless and can be very hard on your shoulders since you naturally don’t press in a perfectly straight line. Get a weight vest and do push-ups with your feet elevated – that’s a much better option. lol i wish i could do benchpress but i dont have the money to buy it, or no gyms near me even have a barbell to squat with let alone benchpress. Anyways, so i usually compensate with backpack pushups. I find these pretty good and i have this iron gym pullup bar where i use the wide grip of that to do backpack pushups to imiatate a benchpress like above. Except i cant drive the benchpress up with my feet cus im in a plank position.